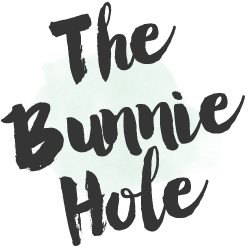 TheBunnieHole | Vancouver Youtuber & Blogger: Magazine: Lou Lou Summer edt! 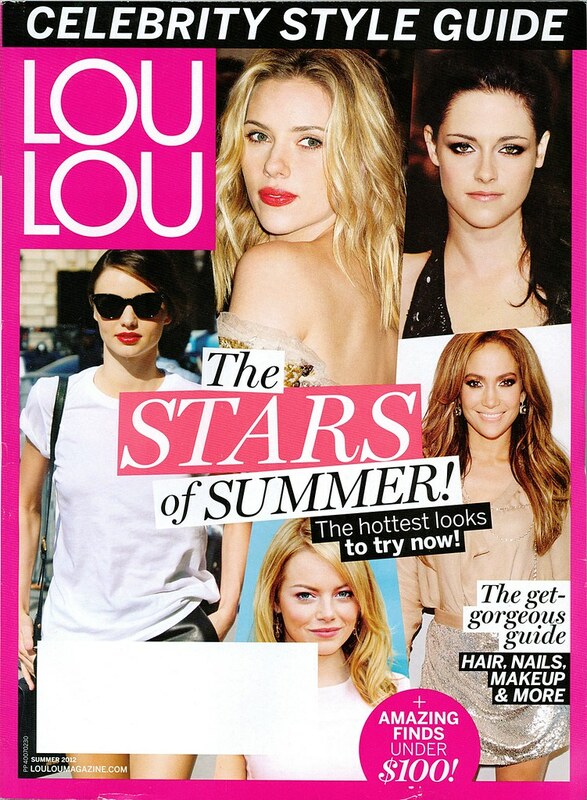 Magazine: Lou Lou Summer edt! What should you be anticipating this summer? 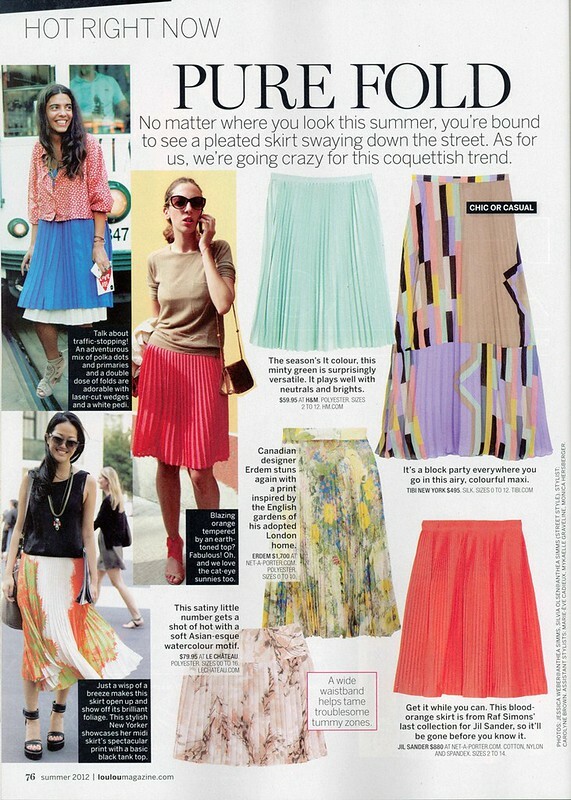 Well, according to Lou Lou it's good skin, girly pleats and a lot of Brit love. Here's some scans from my latest issue of LouLou that just came in my mail. I haven't followed Kate Beckinsale much in her acting career but I must admit she always look so sophisticated and posh. Now that I'm looking at this page again, I definitely need to make a note to check out that Clarins palette since I've been happily using their blush compact. 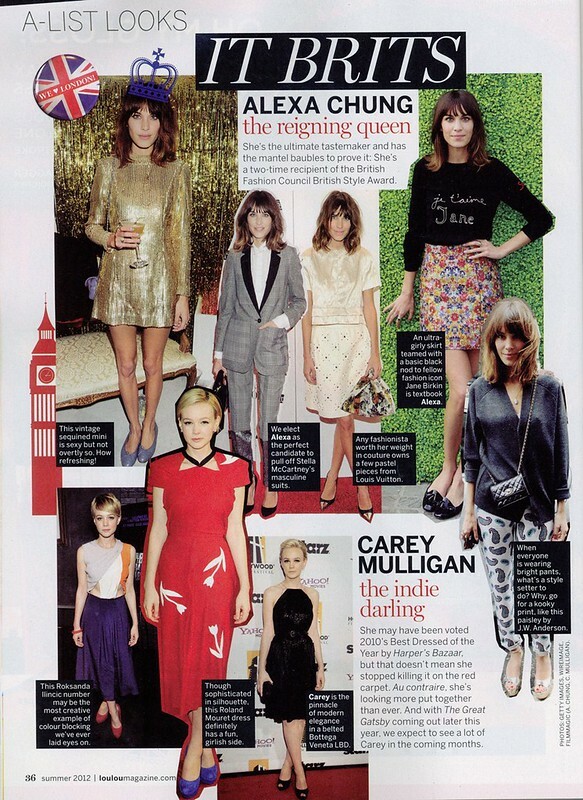 Continuing on the Brit list are fashion pages featuring stylish ladies such as Carey Mulligan and Alexa Chung. Did you guess this would be my favourite page? I don't have nearly as many pastel pieces in my wardrobe as I want to but I just adore the look. I have been wearing pastels nonstop on my nails though! It seems like pleated skirts are back in fashion, they will always remind me a little of the early 90s but you can bring them up to day with modern accessories like a killer pair of heels. 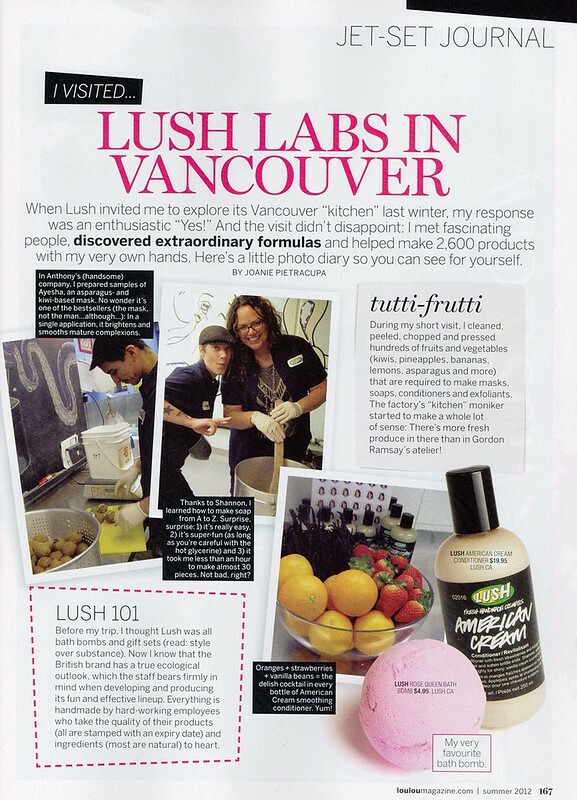 What really caught my attention in this months issue was this special feature on LUSH! 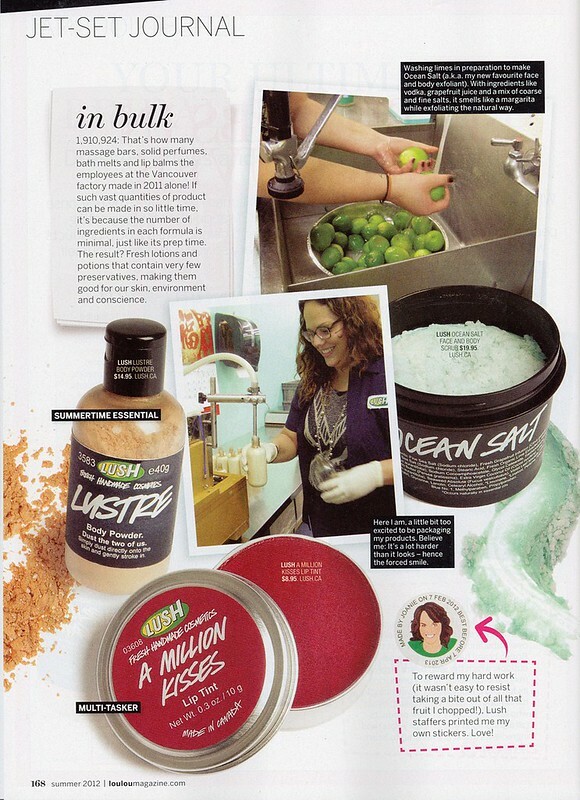 I've dabbled in Lush here and there (mainly because I think they are quite pricey) but I love their brand concept and it's great fun to see what really goes into your slice of Lush soap! After reading this article I actually went to pick up a copy of the Lush Times (the catalogue) so I can start on a Lush wishlist! Your essentials for great summer skin are also featured in this issue. Two big concerns are hydration and controlling shine. Remember that keeping your skin matte doesn't mean you have to dry it out, hydration is just as important when the weather heats up. 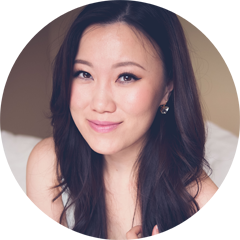 This summer I'm on the hunt for a little colour and have been perking up my ears to bronzing products. They all look stunning in the photographs but wow these are expensive options. My dream is to someday own a Guerlain bronzer, they look expensively luxe and amazing! 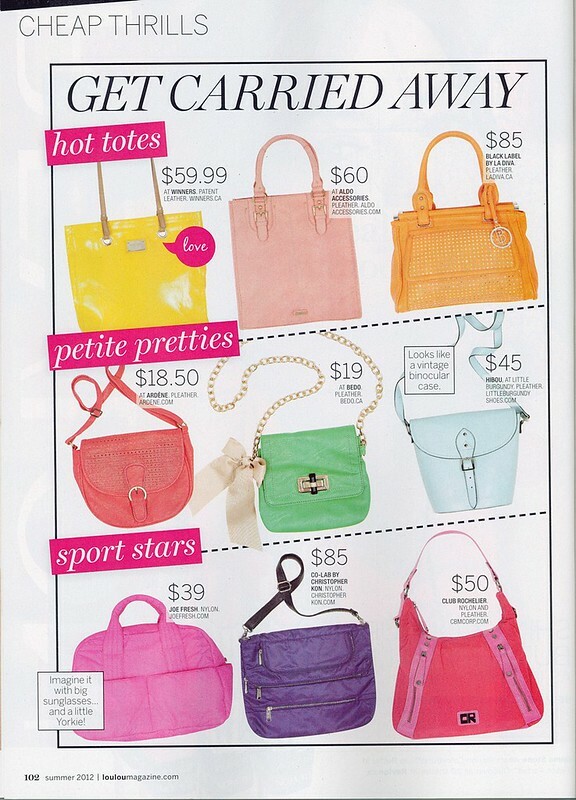 I love the idea of a pastel bag, be it a large tote, a tiny mini or a sporty sling. You can wear a completely neutral outfit and add that one hint of colour in a feminine slightly discrete way. 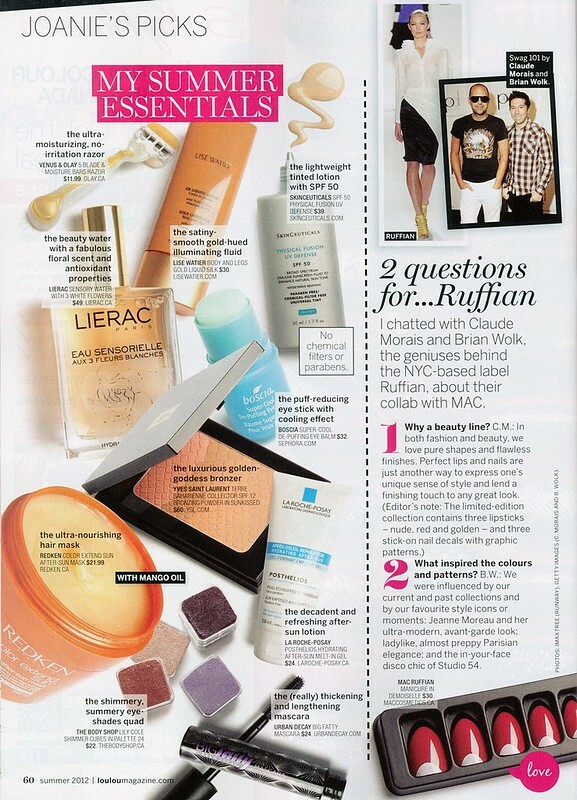 You should be able to find this issue of LouLou in your local Canadian drugstore. I've been greatly impressed by Lou Lou's content recently and even though I can't afford most of the things in these pages, they are great to keep as inspirations in my hunt for low end alternatives.